Like Soylent Green, Boskone is made of people! <Queue a frantic Charlton Heston!> Okay, we’re just kidding about Soylent Green, but people really are what makes Boskone special. Just ask Charlie Stross, Sarah Langan, and Jeff Hecht. It’s the people who bring them back to Boskone. Our Mini Interviews continue with three new perspectives, three new set of stories, and three truly amazing people–all of whom we are excited about seeing at Boskone! Charles Stross, 48, is a full-time science fiction writer and resident of Edinburgh, Scotland. The author of six Hugo-nominated novels and winner of the 2005 and 2010 Hugo awards for best novella (“The Concrete Jungle” and “Palimpsest”), Stross’s latest publications are the novel Neptune’s Brood and the novella “Equoid.” For more information, visit Charlie’s webisite and follow him on Twitter @cstross. Charlie Stross (CS): The weather! Ha ha, no. Actually, it’s all about the people. (CS): Right now I’m working on two tracks: the next couple of Laundry Files novels — “The Annihilation Score” is in production for release in July, and I’m just now starting on “The Nightmare Stacks” for 2016 — and a trilogy of new Merchant Princes universe books — my big fat post-Edward Snowden parallel universe technothriller! (CS): I tell lies for money. Also, I have a warped sense of humour, revolving around beer, computers, bureaucracy, and our endless ability to misunderstand each other. Sarah Langan is the author of the novels The Keeper, This Missing, and Audrey’s Door. Her work has garnered three Bram Stoker Awards, a New York Times Editor’s Pick, an ALA selection, and a PW favorite Book of the Year selection. Her short fiction has appeared in Nightmare Magazine, Brave New Worlds, Fantasy Magazine, Lightspeed Magazine, the Magazine of Fantasy and Science Fiction, etc. She’s at work on her fourth novel, The Clinic, and lives in Brooklyn with her husband and two daughters. For more information, visit Sarah on her website, follow her on Twitter @SarahVCLangan, and Friend her on Facebook. Sarah Langan (SL): It’s cheesy but true: I’m looking forward to seeing old friends, and making new ones. Since having kids five years ago, I pretty much stopped traveling and going to conventions. That was fine for a while, but I find that I thrive on the exposure to other writers. I like going to panels and hearing smart comments, meeting people who are excited about what they do. It’s energizing and reminds me how much I love what I do and how lucky I am to be able to do it. (SL): I’m working on a novel called The Clinic. It’s about a family under duress, an evil clinic, psychic powers, and high frequency trades. I love rolling up my sleeves and getting dirty, learning all about subjects that interest me, and creating characters set in real-life situations that reflect modern times. I’m a social critic, underneath all that gore. But Gawd, it’s a lot of work, and very, very daunting. I’m finally coming to the conclusion that it doesn’t have to be perfect, so much as done. THEN I can work on perfect. (SL): This isn’t genre, but I’ve fallen head over heels for the Italian writer Elena Ferrante. I can’t wait to read part two of her Neapolitan Series, The Story of a New Name. Ferrante’s characters are underdogs, beaten and neglected, trying to figure out how not just to survive, but to thrive in a world that would prefer they fade. Jeff Hecht is a freelance science and technology writer and consultant for New Scientist magazine and Laser Focus World, based in Newton, Massachusetts. His short fiction has appeared in Analog, Asimov’s, Interzone, Nature, and Daily Science Fiction. 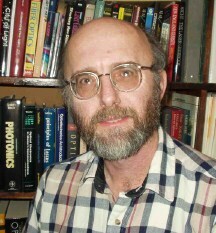 He has written several books on lasers and fiber optics. For more information, visit Jeff on his website and follow him on Twitter @jeffhecht. Jeff Hecht (JH): Meeting old and new friends and talking about interesting ideas. Boskone attracts an interesting group of people, and they make for stimulating discussions. (JH): Answering a tiny little ad in the help wanted section of the Boston Globe 40 years ago. I was getting bored out of my skull writing computer manuals for Honeywell. I had all but finished my project, and was sitting around writing science fiction and sending out resumes. The tiny little ad was from a trade magazine looking for an assistant editor. It turned out to be a laser magazine, and I had worked one summer in a laser lab, and had a degree in electrical engineering. I talked my way into the job. And it was a hell of a lot more fun than computer manuals. It got me launched into a career as a science journalist, something that I hadn’t really thought about very much before. My boss was an old-line journalist who put up with my erratic spelling because I understood more about physics and engineering than he did. He also tutored me in writing. And he turned out to be an old friend of Damon Knight who was not bothered by my side interest in science fiction. I stayed seven years, learned laser geek speak, and quit to become a full-time freelancer and write about more than lasers. That led to more adventures in writing the history of fiber optics, going through the madness of the Bubble, and covering news stories like the Piltdown bird (Archaeoraptor). (JH): I write about lasers and dinosaurs. Seriously. I make my living writing about science and technology, and somewhat by happenstance two of the areas I specialize in are optics (lasers, fiber optics, photonics, and so forth) and paleontology (earth science, history of the earth, fossils, and – of course – dinosaurs. I’ve been known to write fiction about them, but mostly I write science fact, for magazines including New Scientist and Laser Focus World. Sign up to follow the Boskone Blog via email to avoid missing the interview with your favorite author. You can also get more information on the Official Boskone website and by friending us on Facebook. If you’re on Twitter, follow us @boskonenews and look for us using #Boskone. This entry was posted in Boskone 52, Mini Interviews and tagged Charles Stross, Charlie Stross, Jeff Hecht, Sarah Langan. Bookmark the permalink.